Even when trying to take arty shots for an article, my kids seem to find something to argue about…luckily we had a paper to distract one of them! So finding something to do in London with kids that they agree on can be a tad difficult, and we almost always end up winging it. Hoping that when we get there, there is going to be something that they actually like near us. Usually, this ends up with my frantically telling them that it IS fun, or spending too much money on an attraction that might just work to entertain them. Imagine my delight when I discovered that using TripAdvisor gets rid of a lot of the grunt work involved. The site has loads of attractions and tours, which can be booked directly through the site, nicely organised by type of activity. You can even book there and then; ell in advance of your trip, and even be “that mum” for once…. 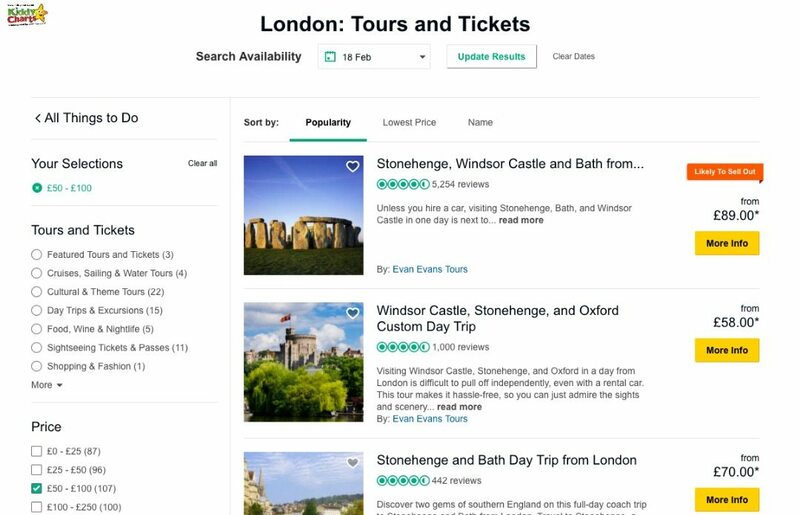 This allows you to narrow down the type of activity, look by date and price (after choosing the shop tours and attractions options in the menu on the left), as well as being able to see reviews on the activities so that you can take a little more time in deciding what will work for your kids, and family. Many of the tours will even pick you up from your hotel, if this is suitable for you, and take you to your destination. 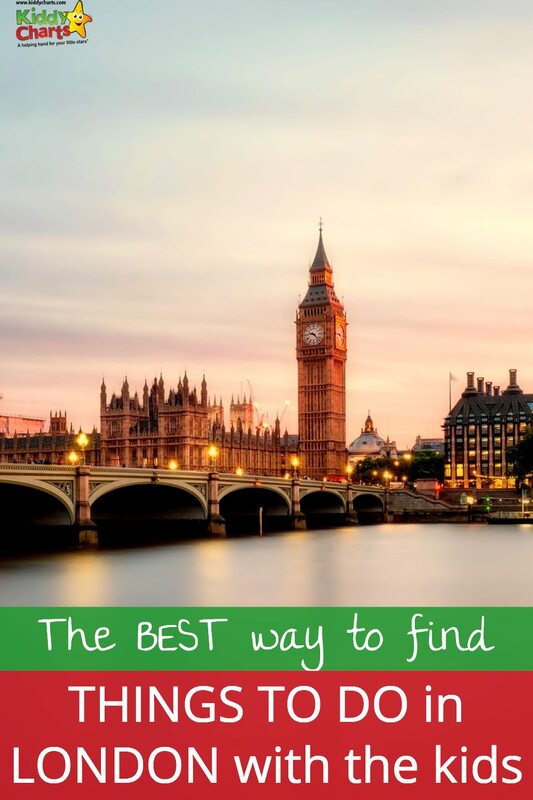 This is perfect if you are looking for a day trip outside of London, or an itinerary around the city to take in the most popular sights in the town. Initially, we were looking for day itineraries around London, but it was clear that the boy wasn’t going to last that long on his feet all day, so we adapted what we might do by looking at the other categories available and easily found a family friendly show instead. 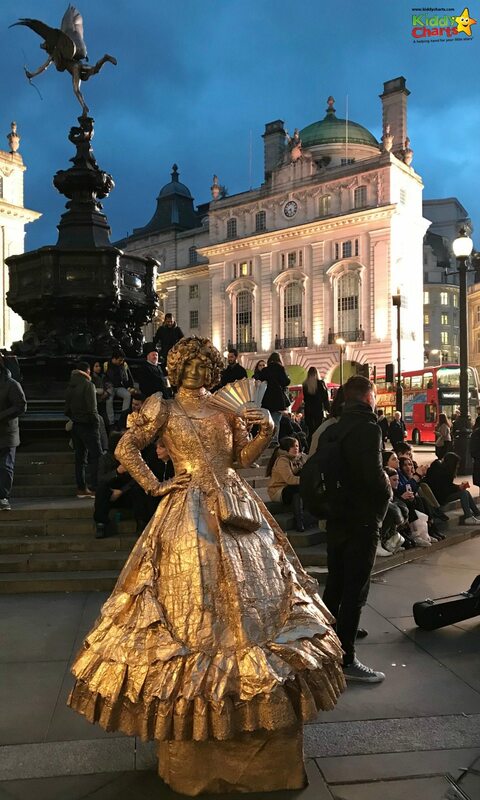 The kids haven’t been to London to watch a theatre performance, expect as a family treat at Christmas; so it was very important to find out what other families thought of the shows available. The children DID love a bit of a farce though, as we discovered when we happened to stumble upon Peter Pan Gone Wrong on the television relatively recently. 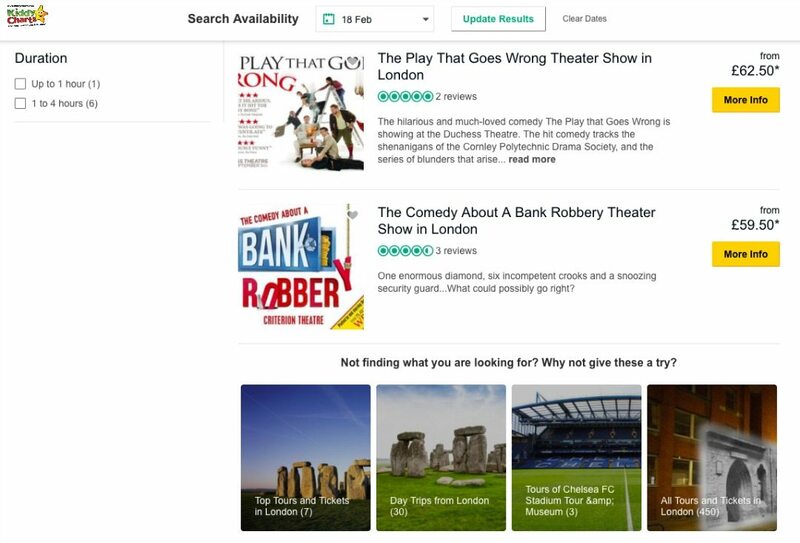 When we looked at the theatre options for families, and there was an option for the A Comedy about a Bank Robbery – suitable for 8+ from the same theatre company, there really was no contest. We booked, and waited patiently for the train to arrive. The wonderful thing about this way of booking was that the tickets were top price, which we wouldn’t normally go for as they can be that little bit too much for us as a family. You could also include a meal upgrade as part of the tour – but we didn’t on this occasion, though it would have been easy to add on. It was £59 each – and tickets were confirmed only 48 hours after the booking; with an easy to print voucher to take to the theatre to collect the tickets before the show. For a London show, for four people; that is about par; and as a memory that will last a lifetime, it is definitely worth paying for. For the reduced hassle of finding a suitable show, and booking well in advance, the price is a bargain! If you do find the tour cheaper within 72 hours of booking, TripAdvisor’s lowest price guarantee means they refund the difference. If you find it is cheaper when you get there too on the day; they’ll do the same too. It is worth noting that the tickets were booked through an agent – and it may be worth checking with them that your seats are in the same row, if this is important to you. Our seats were two front, and two behind; which wouldn’t have been a problem except that my husband was ill, so there was only myself and the kids attending the performance. As we didn’t know our exact seat numbers until we picked them up before the show, we didn’t realise that this had happened until the performance was nearly upon us. Thanks to the theatre though, we did manage to swap them so we were all sitting directly together. 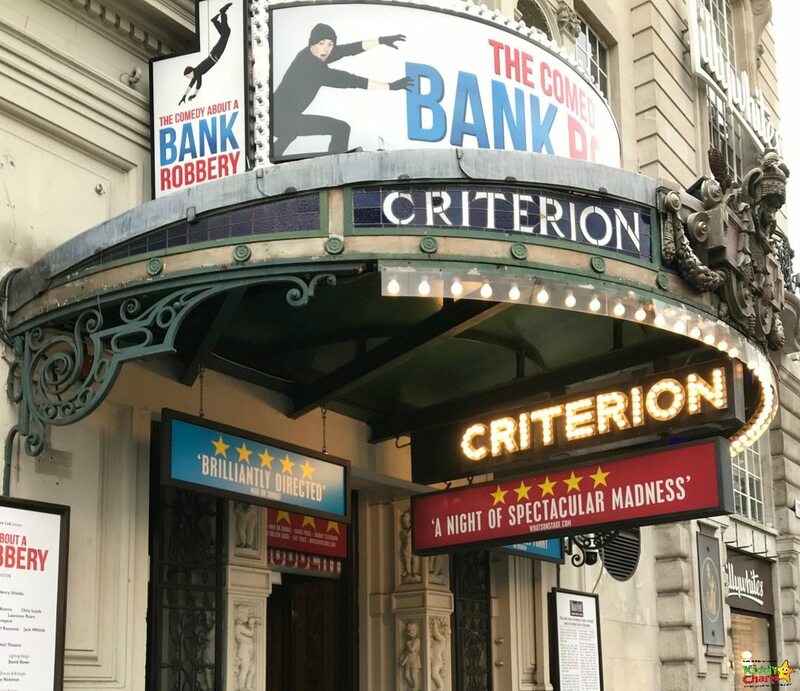 The Comedy about a Bank Robbery – is it one of the funniest things to do in London with older kids? The guidance for this play is 12+ from the Criterion, 11+ from a theatre review site, and 8+ based on the age guidance within TripAdvisor! So it really is largely down to you how comfortable you feel with your kids seeing moderate sexual innuendo! The majority of it centres around the name of some of the characters Robin, and Roger Freeboys. In all honestly, it is all relatively harmless, and unless your kids are teens, probably going to pass them by totally. You can choose to explain it, but we didn’t, and it make no difference at all to their enjoyment of the tour, and the trip. There is a little swearing, and other sexual content here, and there, but nothing my ten and twelve year-olds couldn’t cope with. The swearing is pretty in comedy context too, so is more funny than rude! 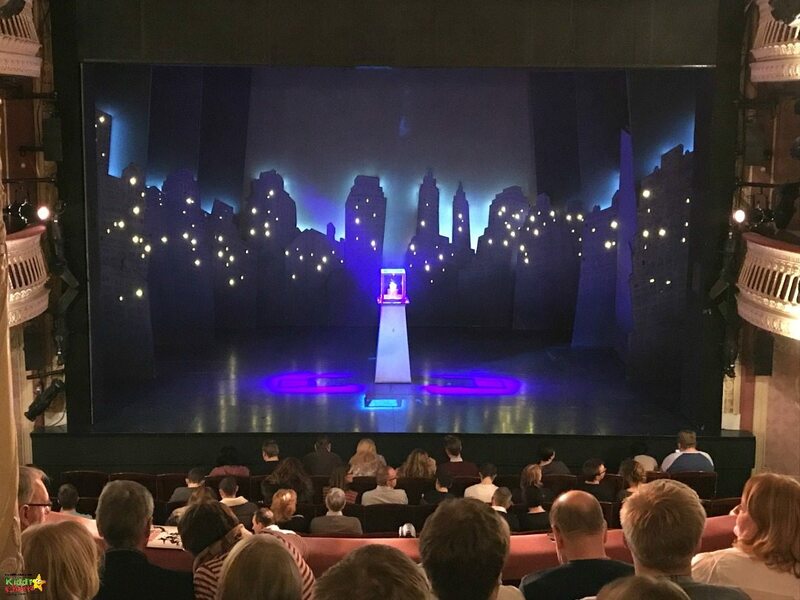 The seats we had were wonderful (after that little bit of re-jigging) – we could see everything so clearly, and the venue (The Criterion Theatre), is so well constructed, that I am not sure there would have been a poor seat in the house anywhere. The play itself is a wonderful farce – the actors comic timing was perfect from the moment the show started, to when the curtain fell. There are so many twists and turns to the play; mixed with confusion, slapstick, a bit of bawdy humour, and throw-head back giggles. Thankfully the giggles are just as strong for the kids as they are for you. In particular, the visual gags in this play with have you on the edge of your seat, and laughing in the aisles in equal measure. Some of the stunts are so original that I don’t even want to tell you about them; as it’ll ruin the joy of the surprise. See I told you they were a pre-teen. Very little words; but high praise indeed from a 12-year old!